If anyone still requires evidence of how old buildings offering accommodation are invariably so much more delightful than their contemporary counterparts, then this should suffice. 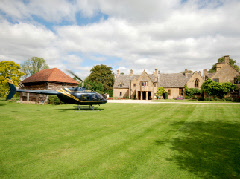 A truly stunning property, Abbots Grange is also one of the finest monastic manor houses in the whole of Britain. Thought to have been constructed during the early 14th century, its original function was as the summer manor of the Abbots of Pershore. However, while its ancient history is fascinating in itself, perhaps its early 20th century heritage will be of interest to most. The home of the celebrated American artist and writer Frank Millet during the late 1800’s and early 1900’s, a steady stream of famous names came to Abbots Grange in search of relaxation and inspiration during that time. Not least of these were Mark Twain (he had been Millet’s best man at his wedding), Henry James, Edward Elgar and Oscar Wilde. Artists such as William Morris also came here, while Millet himself set his most well-known piece Between Two Fires (now in the Tate Gallery, London) in the Great Hall of the house. As a final historic note, Frank Millet was also one of those killed when RMS Titanic sank in April 1912.